See the news for the newest details! Peter Jaeggi is the Immediate Past Governor for the years 2006/7 and is now Chair Albania for Kiwanis District Switzerland-Liechtenstein. He will take care of the Clubs in Albania. What do I find where? Driver: Mr. Beshir Hasa Tel. Nr: 00355692427874. Media: „Vizon +“ and „TV Kavaja“. 17h30 Charter: People assemble in Art Gallery ''Edward Lear ''- Berat . 5-Pelivan Shatri: Head of the Region Council Berat. 09h00 Pres. 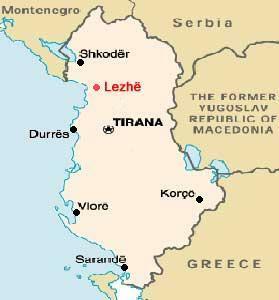 Kastriot Faci: Organisator of trip to Shkodër and sightseeing for Pres. Dave and Denise Curry and KF Adolf Seiferle, arranged by KC Shkodër and KC Tirana –Center. 16h00 Return of Pres. Dave and Denise Curry and KF Adolf Seiferle to the Hotel Diplomat so that they can get dressed for the Charter (17h00). Join us! 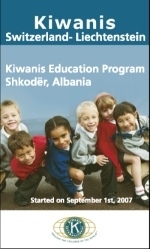 We do not only help children, we also help Kiwanis!